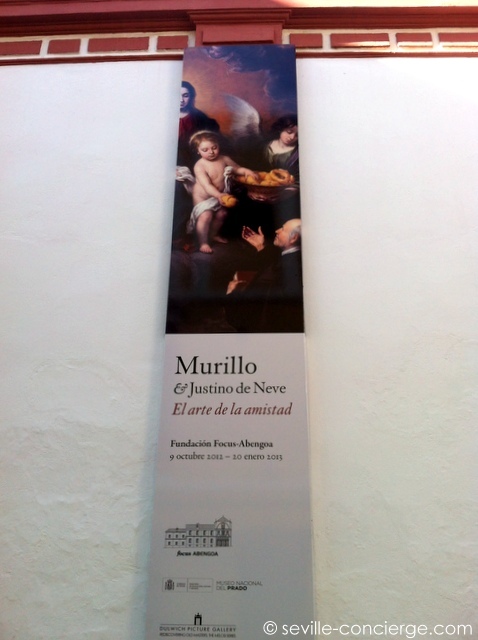 This year is the 400th anniversary of the birth of Bartolome Murillo, probably Sevilla’s most famous painter, and has been officially declared the Year of Murillo. 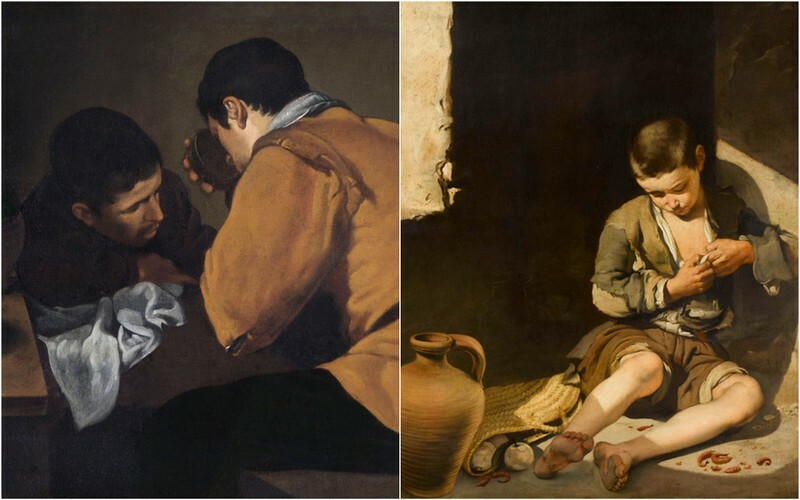 As part of the commemorations the Fundación Focus-Abengoa, in collaboration with the Prado Museum, London’s National Gallery, and others, has organised a very special exhibition comparing the work of Murillo and Sevilla’s other most famous painter, Diego Velázquez. The two painters, born in Seville a generation apart (Velazquez in 1599 and Murillo in 1617), and having their formative influences there, nevertheless had quite different career trajectories, Velazquez leaving Seville to work at the Spanish court in Madrid in 1623, while Murillo spent his entire working life in Seville. It’s not known whether the two ever actually met in person (though they must have been aware of each others’ work), but while there is no record of a meeting, it’s not impossible as Murillo visited Madrid on several occasions, although art experts think that there was only limited reciprocal influence. 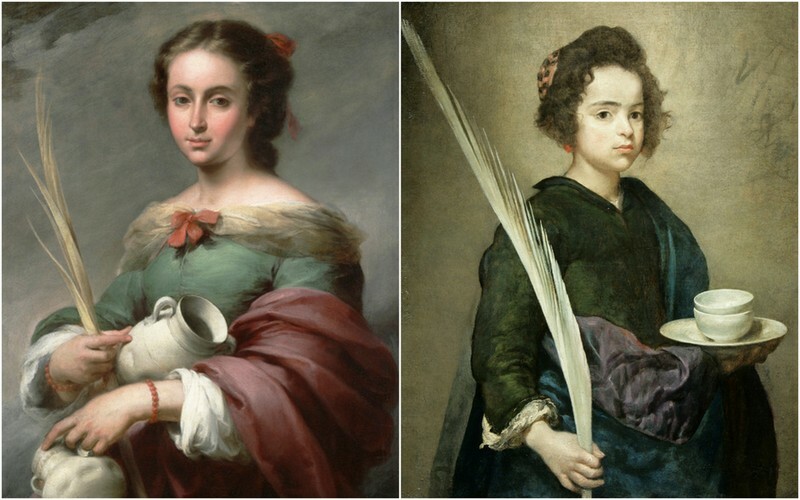 However, it’s clear from the 19 paintings in the exhibition, 10 by Murillo and 9 by Velázquez, that there were common influences in the cultural world of Sevilla in the 17th century. This shows itself in both the choice (or commissioning) of subjects, especially in religious subjects pertaining to Sevilla such as the Saints Justa and Rufina and the Immaculate Conception, as well as of Saint Peter and the Adoration of the Magi, and the highly naturalistic style of the scenes of everyday life. It’s also appropriate that the exhibition is being hosted in the Venerables Hospital, a building that is of the early 17th century, and which has both a historical and current associations with the two painters. Around mid-January the exhibition, which continues until February 28th, surpassed the 50,000 visitor mark. In the heart of the Santa Cruz neighbourhood of Seville, leading up from the Plaza Santa Cruz towards the cathedral, is the little winding street of Las Teresas. If you live in Seville, or have visited as a tourist, you will certainly have walked along it. You will quite likely also have stopped in at its best-known landmark, the delightful Bar Las Teresas, with its rows of jamón Iberico hanging from the ceiling. But diverting though it is, this is not our topic for the day and reason for being here, which is across the street and a couple of doors down. Here you will find yourself in front of a truly impressive wooden door in an ornate portal set in a rather blank and forbidding wall, with just a few barred windows set high up near the roof. 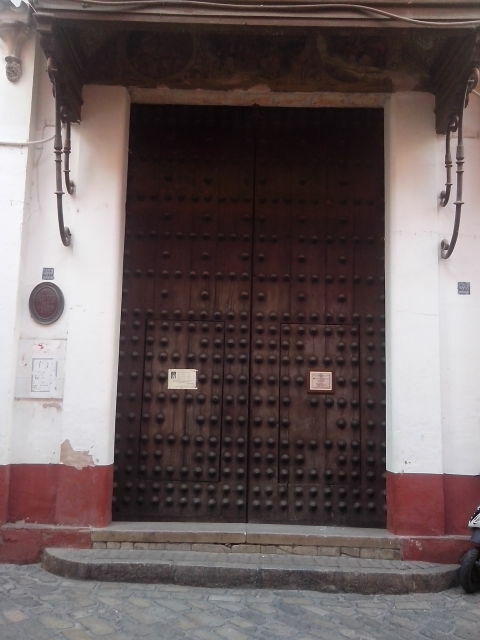 It’s the entrance to the Convent of San José, better known as Las Teresas after its founder Saint Theresa of Ávila. Santa Teresa is one of the Catholic Church’s most prominent saints and theologians, a mystic, writer and reformer of the Carmelite nuns, and the current interest in her is because next year is the 500th anniversary of her birth. She was born in 1515 in Ävila, a small town between Madrid and Salamanca most famous for its virtually intact city wall. Her grandfather had been a Jewish convert to Christianity, and had been investigated by the Spanish Inquisition for allegedly returning to the Jewish faith (remember that the last of the Moors had only been expelled from Granada in 1492, and Christianization of the newly created kingdom of Spain set in motion by Ferdinand and Isabela). Her father, however, had successfully integrated into the new order, and Teresa’s mother was a pious Christian who read Teresa stories from the lives of the saints as a child. After her mother died, when Teresa was 14, she developed a romanticised and sentimental obsession with the Virgin Mary and works of popular fiction about mediaeval knights. Not long afterwards she was sent to be educated by the Augustinian nuns of Ávila, after which, now aged 20, she entered the Carmelite Monastary of the Incarnation, an order enjoined to contemplation and devotion, supposedly founded on Mt Carmel in the 12th century. It was here in the quiet of the cloister that she experienced the ecstatic religious trances for which she is most famous, and developed the mysticism which was her inspiration. At the same time she became increasingly concerned by the lax observance of the Carmelite order in Ávila, and despite some initial opposition set up a reformed Carmelite (the discalced, or barefoot Carmelites) convent in Ávila, the beginning of twenty years of reform and founding of new convents which bring us back again to the starting point of our article. On May 26, 1575, Teresa arrived in Seville with a few nuns, for the purpose of founding a convent (her eleventh). To begin with they rented a house on Calle Zaragoza, where they stayed for ten years, but the location was never satisfactory. In those days (Seville’s Golden Age at the height of the America’s trade) Zaragoza was one of the main streets leading down to the port, a noisy place full of taverns, sailors and traders. Eventually, with the help of San Juan de la Cruz (Saint John of the Cross), they were able to buy the property in Teresas Street which has been their home ever since. Although not open to the public, it included among its possessions the only known portrait of Teresa painted during her lifetime, and the original manuscript of her best known work, Las Moradas, the Dwellings of the Interior Castle. Teresa herself never saw the order’s new home. In 1582 while travelling in northern Spain she was taken ill and died. By one of those strange quirks of fate or history she died on the night when the Church was switching from the Julian to the Gregorian calendar, with the removal of the dates October 5-14 that year. Teresa died either late in the evening of October 4 (Julian), or in the early hours of October 15 (Gregorian). She was beatified in 1614 and canonized in 1622, and remains one of the Catholic church’s most popular and important saints. If you’re in, or have ever been to, Seville, you may have noticed pictures of two young ladies in mediaeval dress, surrounded by pottery and supporting a model of the Giralda tower between them. The picture is most probably a reproduction of the painting by Seville’s favourite artist, Bartolomé Murillo (1617-1682), and the two young ladies are the Saints Justa and Rufina. 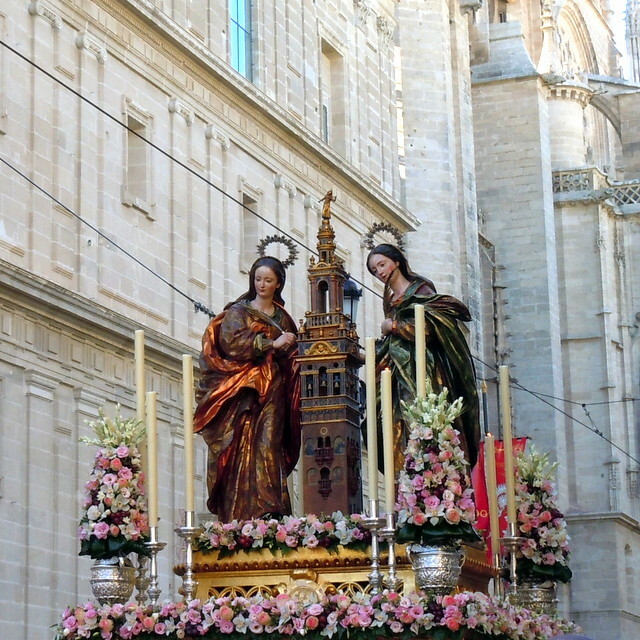 Although not technically the patron saints of Seville (that honour goes to Ferdinand III, who reconquered the city from the Moors in 1248) they are considered the special protectors of the Cathedral and the Giralda, which they preserved from harm during the 1755 Lisbon earthquake, and are also patrons of potters and pottery sellers. According to legend they lived in the Triana neighbourhood of Seville in the 3rd century, during Roman times, where they made fine earthenware pottery, a trade by which they supported both themselves and many of the city’s poor. However, they refused to sell what they made for use in one of the city’s pagan festivals, and had all their pots and dishes smashed by angry locals. In retaliation they smashed a statue of the Goddess Venus, and for this crime they were arrested and imprisoned by the Roman prefect Diogenianus. Unable to persuade them to renounce their Christian faith Diogenianus had them tortured on the rack and with hooks, and then forced them to walk barefoot to the Sierra Morena (a mountain range to the north of Seville). Seeing that their resolve was still unshaken they were deprived of food and water. Justa was the first to die, and her body was thrown into a well. Diogenianus expected that the death of Justa would break Rufina’s spirit, but when it didn’t she was thrown to the lions in the amphitheatre. However, even the lions refused to co-operate and devour her, and Diogenianus finally had her strangled (or possibly beheaded), and her body was burned. Both bodies were recovered by Sabinus, the bishop of Seville, and given a Christian burial in 287. Their saints’ day is July 19. Right in the heart of the Barrio Santa Cruz, in a charming little square of the same name, is the Hospital de Los Venerables Sacerdotes (Hospital of the Venerable Priests), founded in 1673 by the dean of Seville Cathedral, Justino de Neve, as a home for sick and retired priests, and used for this purpose until the late 1970s. Apart from being quite big, it’s nothing particularly special from the outside, but like so many buildings in Seville the treasures, both arquitectural and artistic, are on the inside, looking away from the troubles of the world outside. Today Los Venerables is an important museum of the Barroque period (roughly, the 17th century) in Seville, and brings together some of the works of the most gifted artists and architects of that period. It was designed by Leonardo de Figueroa, who also worked on the San Telmo Palace, the Fine Arts Museum, and the Church of Santa María Magdelena, and features an unusual central patio with elevated arcades and a sunken central fountain. The complex includes a church that is surely one of Seville’s hidden jewels. Although modest in size, with only a single nave, the harmony of the shape of the barrel-vaulted roof and the decorations and other artworks, principally by Juan de Valdés Leal makes this a very special place. In rooms that were once the home of ageing priests are the museum’s art collections. The permanent collection focuses on the life and times of Diego Velázquez, and includes both works by Velázquez himself, as well as other important artists of the time. From October 9 until January 20, 2013 there is also a special exhibition of works by Seville’s most famous painter, Bartolomé Murillo, which has been brought together in collaboration with the Prado Museum of Madrid and London’s Dulwich Picture Gallery, and offers a unique opportunity to see them in the city where they were created.